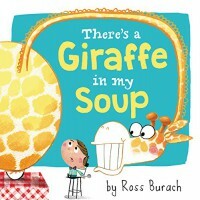 There's a Giraffe in my Soup is a great book, that has outrageous situations. While trying to eat a bowl of soup, there is everything from an alligator to a whale to a lion in the soup. The waiter thinks that there is no way that these animals could possibly be in the soup, but they always are. I think this would be a great book for a classroom library. It is an easy to read book and shows that being silly in your writing is perfectly okay. I would love to see students write a short silly story after reading this book.